A classic & comfortably readable type with elegant display variants. 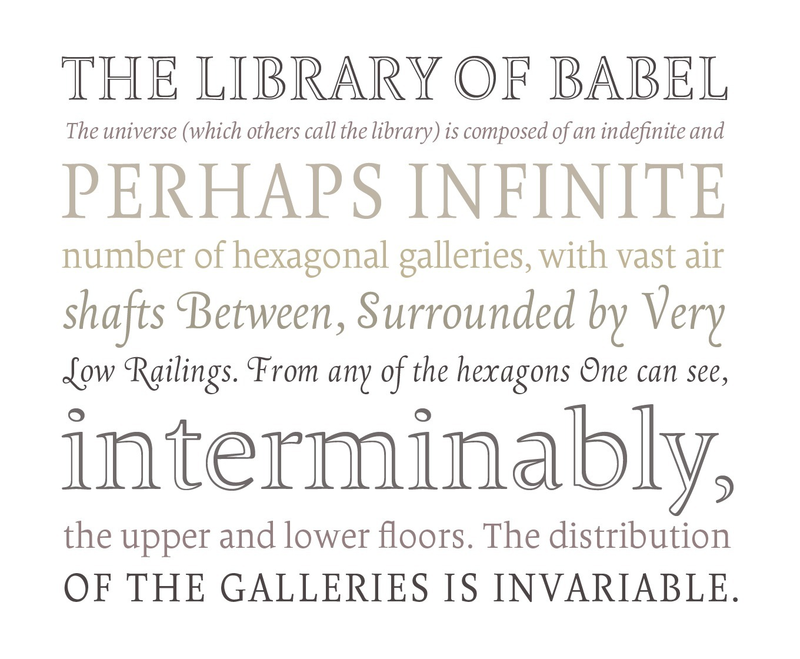 The Borges family includes 15 fonts: a text set of roman, cursive and smallcaps in 4 weights, plus two titling fonts and a contemporary elegant chancery. Borges supports up to 50 different languages such as Spanish, English, Portuguese, German, French, Italian, Dutch, Swedish, Finnish, Danish, Irish, Basque, Icelandic, and Luxembourgian in Latin and other scripts. Borges is a versatile type family designed by Alejandro Lo Celso, inspired by the literature of Argentinian writer Jorge Luis Borges. It is a very legible & classic type designed with a contemporary feeling. Its delicate sense of rhythm delivers a comfortable legibility at reading. It was conceived for editorial use, though it is suitable for a variety of designs. Borges is composed of fifteen fonts: four full weights of roman, cursive and small caps, as well as two elegant titling fonts and a contemporary chancery named Borges Poema. The Borges titling open face gained the Matthew Carter prize at the Morisawa awards, Tokyo 2002. Download print and screen specimens of Borges from PampaType.com.